While in Private Radio studio recording the Crime Family CD, we noticed these odd objects piled in a corner. Turns out these belonged to one of the studio owners, and he was getting ready to sell 'em to a client. We had to set 'em up and take a look at 'em. That's Dana Sims, Crime Family drummer as the test driver. These were made presumably in the seventies by a company called Staccato, by a designer who perhaps went to too many Yes concerts. Couldn't tell you how they sounded, because they needed new heads, but they seemed to be made of fiberglass or plastic. Obviously sound was a secondary concern in their design. 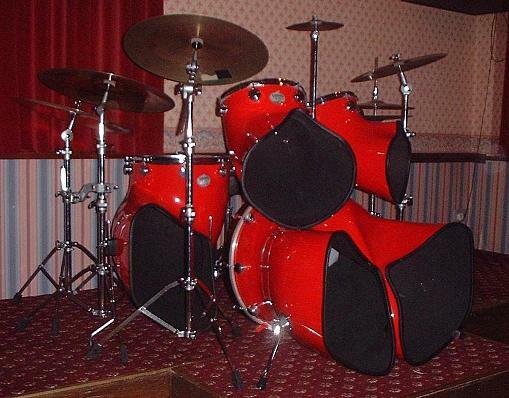 (Chad Channing had a similar kit called North drums years ago, not as outrageous looking but more solidly built. You can see 'em on Bleach if you look closely.) These Staccatos have since been SOLD and are no longer available. Below is an original advertisement for these drums from an old magazine, sent to me by a correspondent (thanx!). Here's another Staccato kit. Thanks to Paul Tuite (England) for the photo.